Last week we passed The Holy Land experience in Orlando, Florida. Pictured is the Church of All Nations auditorium. It's a non-denominational Christian theme park and church owned by the Trinity Broadcasting Network. Among their many exhibits, they have a Jerusalem Street Market, a Last Supper Communion where guests can partake of the last supper with Jesus and the disciples, a Prayer Garden, and a replica of a boat found in the Sea of Galilee, called The Jesus Boat. They even have a re-enactment of the crucifixion! Boy, that sounds like a lot of fun. 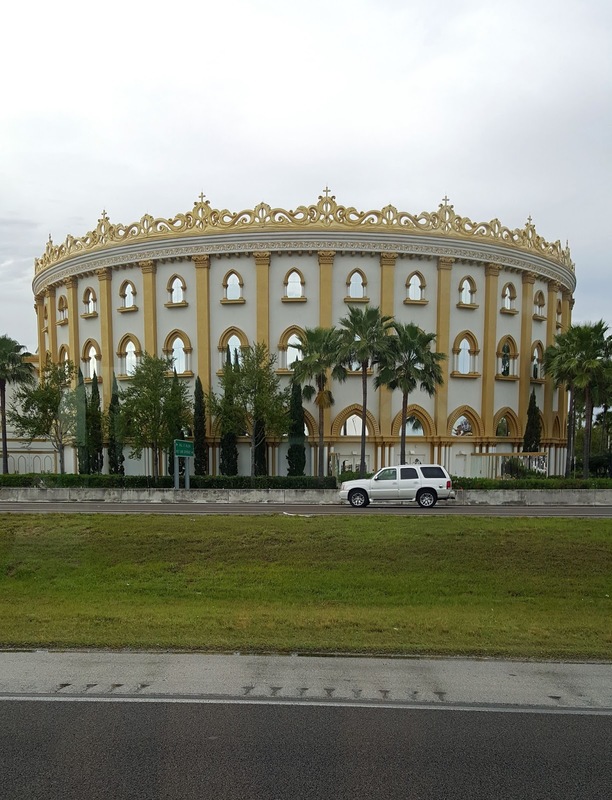 This photo taken as we were driving by because I couldn't imagine ever stepping foot into this sacrilegious monstrosity. I'd rather go to a park full of dicks. I agree with you. It's all about the money, isn't it?